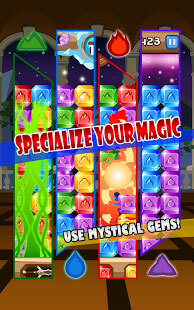 Pixelmatic has announced the worldwide simultaneous launch of Gem Wizard for iOS and Android devices. Gem Wizard is a new match-3 title that uniquely combines blitz gem popping gameplay with RPG item collection and crafting mechanics. In Gem Wizard, players can send free gifts and compete with their friends in a Weekly Battle tournament. Players are rewarded with gems and materials after each game, which can be combined through a simple match-3 crafting system to create mighty weapons and high level mystical gems. By socketing gems into magic wands and other fantasy themed weapons, players can completely customize their abilities to suit their style of play. Gem Wizard is available in nine different languages including: English, French, German, Spanish, Russian, Japanese, Korean, Traditional Chinese, and Simplified Chinese. Bite-sized Gameplay: Players match 3 gems of the same color in an exciting 60 second blitz. Item Collection: After every game, players have a chance to earn gems, materials, and items. The game also has over a hundred unique weapons with special bonuses and more are on the way. Item Crafting: With a simple match-3 crafting system, players can easily create high level gems and powerful weapons. Magic Customization: Players can completely customize their magical powers by collecting 5 types of socketable gems, each with its own distinctive ability. Daily Rewards: Players can open a treasure chest for free each day to find great items. Weekly Battle: Players compete head to head with their friends for the top of the leaderboard and earn prestigious medals. Achievements: The game has over 70 fun and challenging achievements for players to attain. Gem Wizard is now available as a universal app to download for free from the App Store and on Google Play. After logging in with a Facebook account, all progress and data is synchronized to deliver a seamless cross-platform experience on all supported devices. Fans can find the latest Gem Wizard news, contests, and giveaways on Facebook, Twitter, and the official website. Gem Wizard is completely free to play but some in-game items such as extra energy or premium weapons will require payment. The payment feature can be turned off by disabling in-app purchases in your device’s settings. iTunes has rated Gem Wizard 4+. The game requires iOS 4.0 or later and is compatible with iPhone 3GS, iPhone 4, iPhone 4S, iPhone 5, iPhone 5c, iPhone 5s, iPad, iPod touch (3rd generation), iPod touch (4th generation), and iPod touch (5th generation). This app is optimized for iPhone 5. Google Play has rated Gem Wizard as suitable for everyone. The game requires Android 2.2 and up. This entry was posted on Monday, March 10th, 2014 at 8:31 am and is filed under Casual, Everyone, Mobile, National News, New Releases, Puzzle. You can follow any responses to this entry through the RSS 2.0 feed. You can leave a response, or trackback from your own site.